We had a very good run through this afternoon - on the stage from Monday. 11 days to go! It is in splendid order - we now have to get all the technical elements in the same fine shape and we will be happy! By popular demand there are some pictures of today's rehearsal in the album to the left. I will be adding to this as and when I have time over the coming days. The production is going to look really beautiful so watch for some lovely things next week! 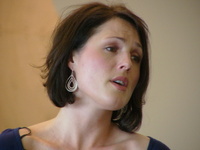 And here (left) you can see our wonderful two sopranos.......Sarah Coburn (above) and Leah Partridge. Nixon production rehearsals start tomorrow afternoon so we are all at full steam ahead. The next five weeks is going to be interesting!